Discover the treasures of the Rhine River over the course of this 8-day itinerary between Basel and Amsterdam. 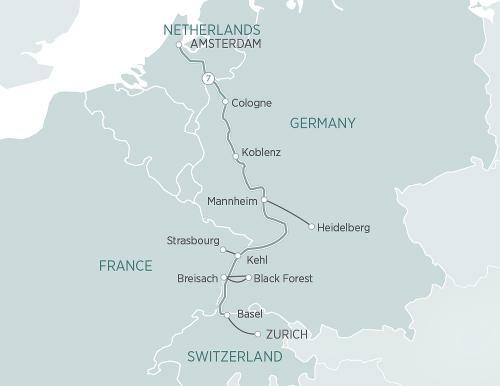 You’ll visit Cologne, Strasbourg and the Black Forest during this wonderful river cruise. Your journey on this majestic European passageway begins in the Swiss city of Basel, and follows the course of the river as it twists and turns through the beautiful Rhineland, where you’ll stop at the Black Forest, Mannheim and Koblenz, enjoying such excursions as a Black Forest cake tasting session and a visit to the impressive Ehrenbreitstein Fortress. Cologne is the next stop, and here you can enjoy a guided tour of the city, taking in such sights as the mighty Kölner Dom, Museum Ludwig and the Shrine of the Three Kings. Then it’s onward and into the Netherlands, where you’ll awake in Amsterdam and enjoy a wonderful day of sightseeing in the elegant Dutch capital.